When I think of my rotisserie chicken recipes, my mouth waters. Nothing tastes better than bringing a warm chicken home from the supermarket. Did you know you can easily make this at home? Just buy some whole chickens on sale and fire up the grill (or the Ronco), and use my homemade rotisserie chicken rub recipe. Prepare the rotisserie and place the chickens on it. Roast until done and ENJOY. You may also slowly roast the chickens in the oven. Preheat to 250 degrees and place the chickens in a roasting pan and cook uncovered for 5 hours, or until a meat thermometer reads 170 degrees in the thickest part of the chicken. I have more than just beer can grilled chicken recipes, click on the link below for more succulent chicken recipes. Here's another rotisserie chicken recipe that is tasty and so easy to make. Place securely on rotisserie skewer. Dry thoroughly with paper towels. Rub with butter and sprinkle with salt. Cook bacon slices in boiling water for one minute. Secure the strips of bacon over the breast and thighs with string. Preheat your grill and prepare you rotisserie. Place a drip pan under the place where the chicken will be and fill it half full with water. Keep water in this pan during the cooking rime. Place chicken on grill with a medium heat. Cook until the center of one breast reached 165 degrees; about 2 hours. Remove bacon about 15 minutes before the chicken is done and baste with drippings from the pan. Here's another spectacular rotisserie chicken recipe. This wet rub recipes produces a succulent and juicy chicken. Clean the chicken well and season inside and out with salt and pepper. Combine wet rub ingredients in a saucepan over medium heat. Mix until honey is completely melted and mixture is smooth. Clean and prepare chicken for rotisserie. Baste chicken with sauce and place on rotisserie on preheated grill. Cook for about 45 to 50 minutes at a temperature around 400 degrees basting occasionally with sauce. 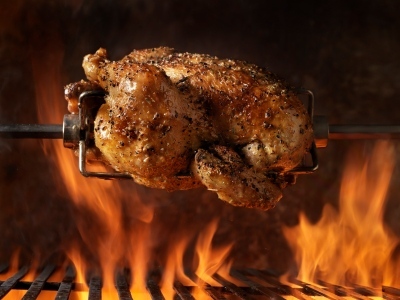 Take the chicken off the grill when internal temperature reaches 170 degrees. Remove from grill and wrap tightly in foil. Let sit for about 15 minutes, then carve. Mix or shake together in a sealed bag and store in a airtight container.